White-throated Sparrow snapped on a walk yesterday. Crisp facial markings make the White-throated Sparrow an attractive bird as well as a hopping, flying anatomy lesson. There’s the black eyestripe, the white crown and supercilium, the yellow lores, the white throat bordered by a black whisker, or malar stripe. They’re also a great entrée into the world of birdsong, with their pretty, wavering whistle of Oh-sweet-canada. These forest sparrows breed mostly across Canada, but they’re familiar winter birds across most of eastern and southern North America and California. Packing proceeds apace. We move out on November 28, close on November 29 and start heading south (with the birds). This entry was posted in Uncategorized and tagged birds, White-throated Sparrow on November 18, 2016 by Amy. Maple leaf by the pond. Frosty raspberries in the garden. These raspberries fruit in June too. American Robin in the winterberry. This winterberry grew wild here by the garden. I saw a flock of these sparrows mixed with lots of juncos yesterday on a walk along the old rail line in town. Radar carries a small log across the frosted grass, back field. A bit of color left by the pond house. Today is the day the ginkgo out front will start dropping all its leaves, dramatically. We can stand at the window now and watch them fall. Nothing gold can stay, right? This entry was posted in Uncategorized and tagged American Robin, birds, White-throated Sparrow on October 27, 2016 by Amy. What a morning. We are reaching the peak of color out back by the pond, field and red maple swamp. 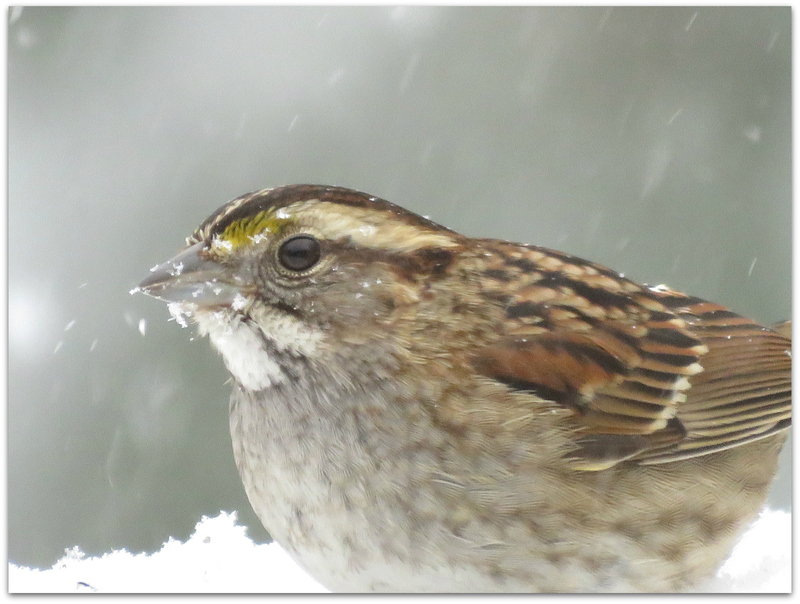 White-throated sparrow, a bird we see in winter. Sun coming up, moon going down. Pretty sure this tree had leaves yesterday! Must remember these colors. They go so fast. And we go soon. House closing date is Nov. 29. A nice place for a dog walk. Yellow-rumped warblers are still here. This entry was posted in Uncategorized and tagged autumn, birds, White-throated Sparrow, Yellow-rumped Warbler on October 20, 2016 by Amy. White-Throated Sparrow looking very well fed. This entry was posted in Uncategorized and tagged backyard birds, birds, White-throated Sparrow on May 12, 2016 by Amy. A flock of about 10 White-throated Sparrows has been hopping and scratching around the yard for a few days. They sing first thing in the morning, last thing in the evening, and off and on all day. Now their pretty song (YouTube video here) is really stuck in my head. White-throated Sparrows sing a pretty, thin whistle that sounds like Oh-sweet-canada-canada or Old-Sam-Peabody-Peabody. The whistles are even but typically move slightly up or down in pitch by the second or third note. The whole song lasts about 4 seconds. White-throated Sparrows sing often during the breeding season, even in the middle of the day, and on their winter range as well. This entry was posted in Uncategorized and tagged birds, birdsong, spring, White-throated Sparrow on April 27, 2016 by Amy. White-throated Sparrow on the lawn under the feeders. I have only seen one or two a few times this winter. Or maybe I am not noticing them. They don’t move very quickly; they do not flit and flutter. And they are well-camouflaged, especially now that our snow cover is melting away over several 40 degree days. 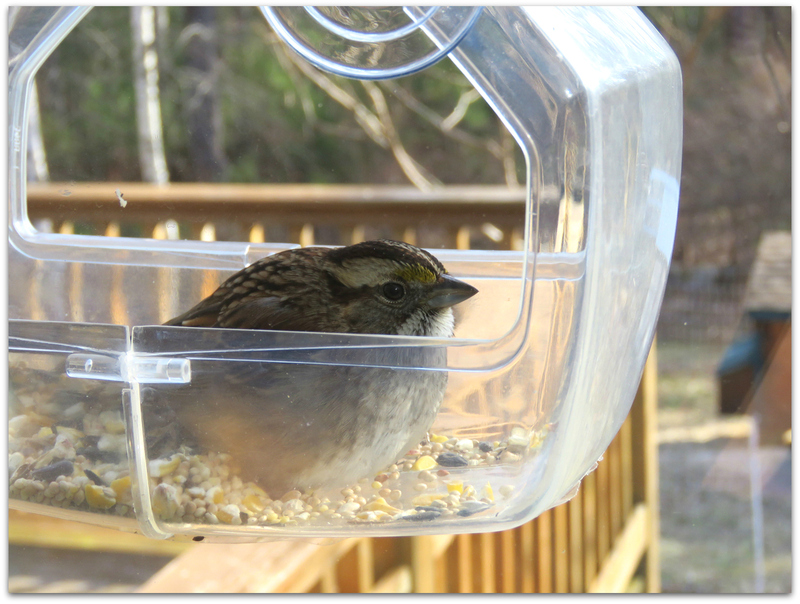 This entry was posted in Uncategorized and tagged birds, White-throated Sparrow on January 28, 2016 by Amy. White-throated Sparrows in a large mixed flock of sparrows scuffling around in the backyard leaves yesterday. There were Dark-eyed Juncos and Fox Sparrows too. Fox Sparrow, not a first in the backyard but on first on this blog, somehow. I am pretty sure I saw them last winter, or maybe spring or fall. Typically seen sending up a spray of leaf litter as they kick around in search of food, Fox Sparrows are dark, splotchy sparrows of dense thickets. Named for the rich red hues that many Fox Sparrows wear, this species is nevertheless one of our most variable birds, with four main groups that can range from foxy red to gray to dark brown. Since they breed primarily in remote areas, many people see them in winter when the birds move into backyard thickets. This entry was posted in Uncategorized and tagged Fox Sparrow, White-throated Sparrow on November 12, 2015 by Amy. White-throated Sparrow hopping in the grass, a couple of weeks ago. Small flocks have been visiting. 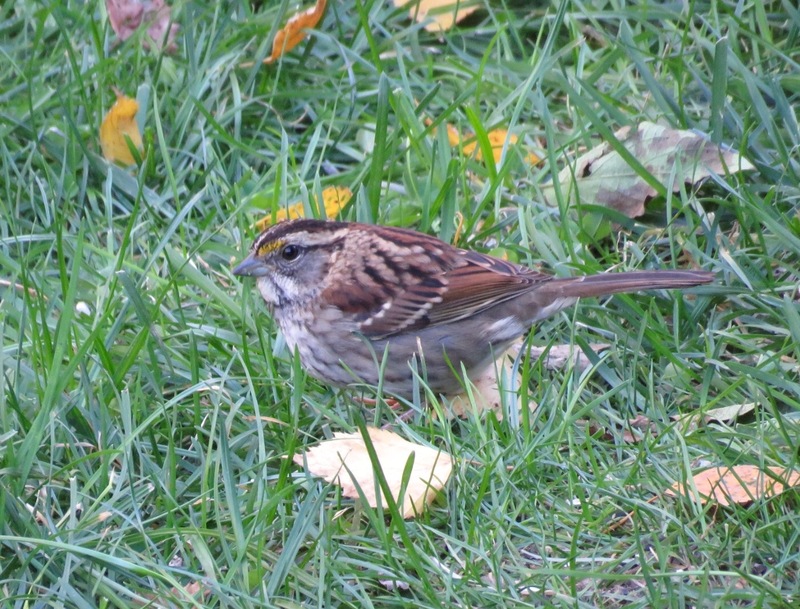 This entry was posted in Uncategorized and tagged White-throated Sparrow on November 6, 2015 by Amy. More big snow yesterday. What else was there to do but watch birds? Anyway, it was one of my two counting days per week for Project Feederwatch. FeederWatchers periodically count the birds they see at their feeders from November through early April and send their counts to Project FeederWatch. FeederWatch data help scientists track broadscale movements of winter bird populations and long-term trends in bird distribution and abundance. I bet there are two that visit our feeders, I just didn’t see them at the same time on Sunday or Monday. Subtly beautiful colors, a Mourning Dove. I like their calmness, as the other birds flit and flap. The most I saw at once: 7. A male Downy Woodpecker, black and white with a little red cap. In two days I counted 96 individual birds of 19 species. Three downies, one male and two females. 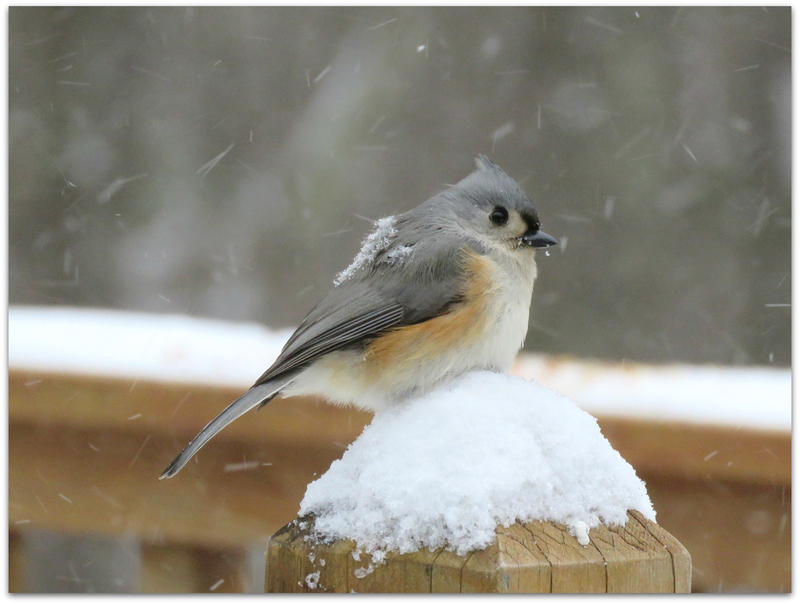 Five Tufted Titmice in total, but with the definite impression I am missing some as they move so quickly. Although not quickly enough for the snow. This is the first time I noticed snow building up on some birds! What a February we are having. And today is only the 10th. 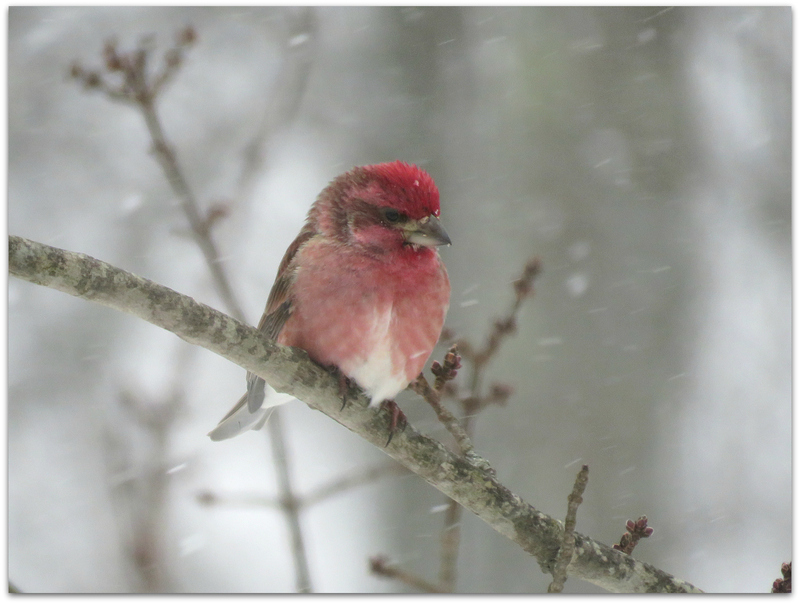 A little birdie Valentine: Purple Finch. The state bird of New Hampshire looks lovely in snow. I counted two males yesterday. The pestiferous though kinda pretty European Starling. At one point there were 9 in the birch trees watching the feeders, as I stood on the other side of the sliding glass door and watched them. They are spooked by people, still, but I bet they will learn fast to ignore us. They seem to eat anything but especially like my homemade suet dough. So do the bluebirds – who are not afraid of me. I scared the starlings away a few times so the bluebirds could eat too. 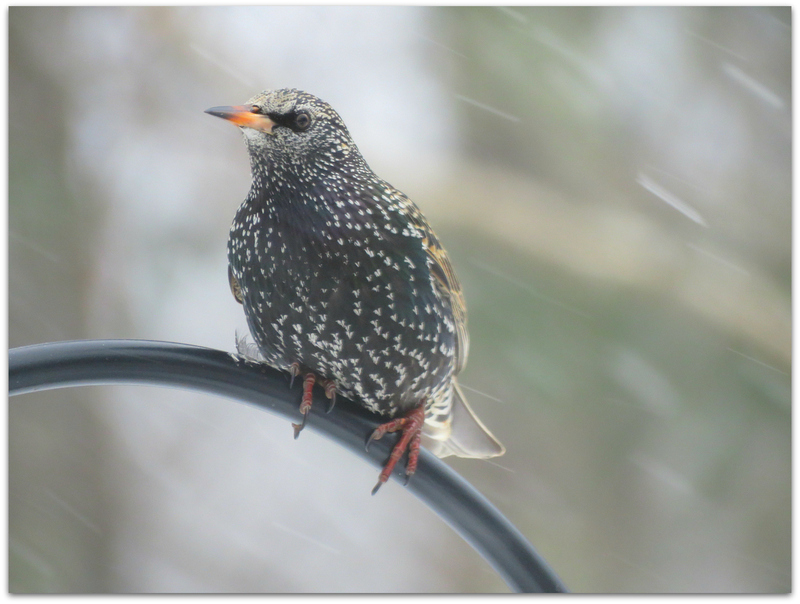 I may need to consider a special starling-excluding feeder if I get too many of them. American Tree Sparrow, with its rusty-red buzzcut hairdo. 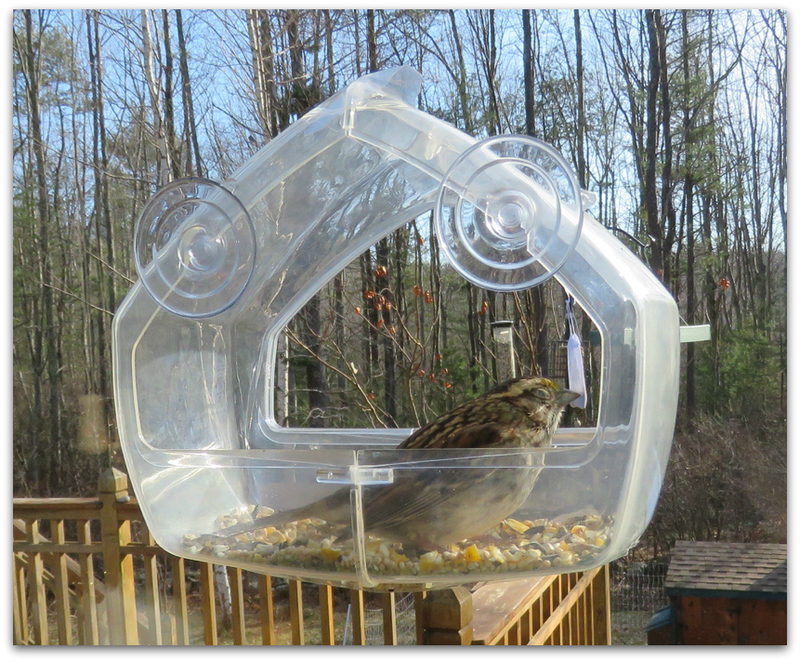 It has been a harsh winter here in New England and feeding birds can certainly help them survive. Birds that have stayed the winter or migrated from further north to feast on natural seeds and fruit in our area will be finding that the winter supply of natural food is being depleted. Our resident birds appreciate the added handout that feeders provide. 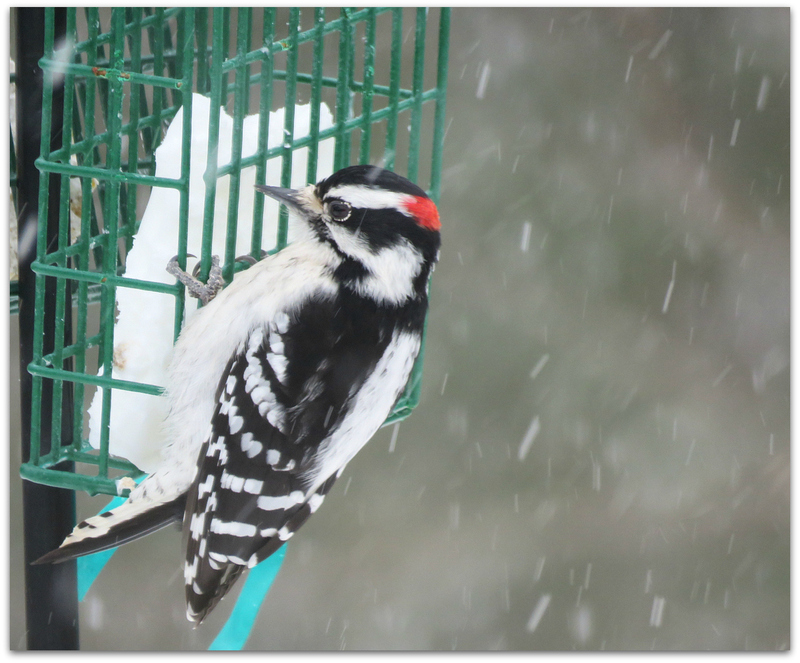 In addition to the nourishment that bird seed and suet provide, the birds expend less energy and burn less fat, helping them to survive the cold. 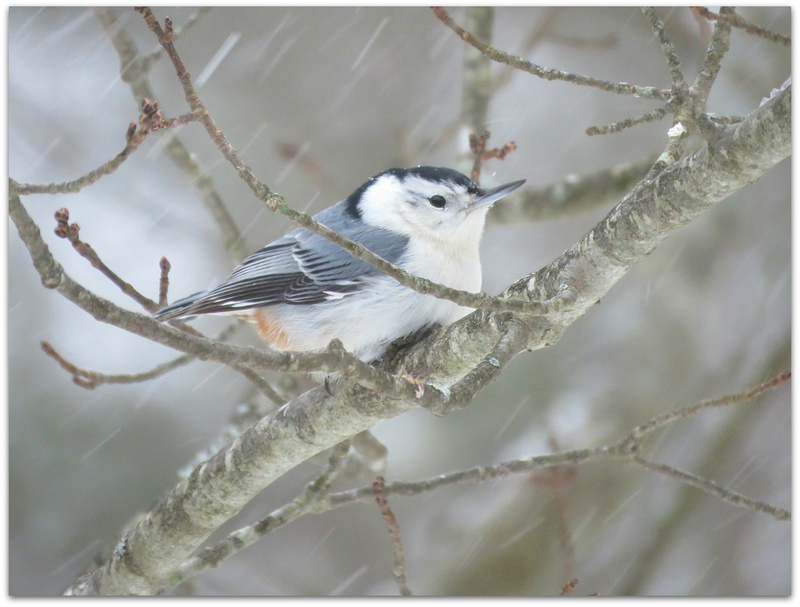 A number of birds that don’t normally stay the winter or that may be here accidentally and are not used to New England weather are particularly helped by seed and suet at feeders. This entry was posted in Uncategorized and tagged American Tree Sparrow, downy woodpecker, European Starling, Mourning Dove, project feederwatch, Purple Finch, Tufted Titmouse, White-breasted Nuthatch, White-throated Sparrow, winter birds on February 10, 2015 by Amy. I was propped on pillows in bed writing yesterday’s blog post. My husband was in the backyard, bundled up and headed out to the back field and woods with the good old dog. Bang! Something hit the window. “Bird strike!” I could hear him say. He bought me the bird. I stepped out on the back deck to see. … with a buff-on-brown face pattern instead of white-on-black. “Will it be okay?” he asked. I brought it inside to warm up, and because I didn’t have a coat on and it was very cold outside. It was panting a little. Winter is a bad time for bird strikes at our house, probably because the leaves are off the trees and there is more light and more reflection from the low angle of the sun. We have decals on the big south-side windows where strikes happen, but I think the hawk that has been hanging around may be scaring some birds into the windows. If you find a bird dazed from a window hit, place it in a dark container with a lid such as a shoebox, and leave it somewhere warm and quiet, out of reach of pets and other predators. If the weather is extremely cold, you may need to take it inside. Do not try to give it food and water, and resist handling it as much as possible. The darkness will calm the bird while it revives, which should occur within a few minutes, unless it is seriously injured. Release it outside as soon as it appears awake and alert. 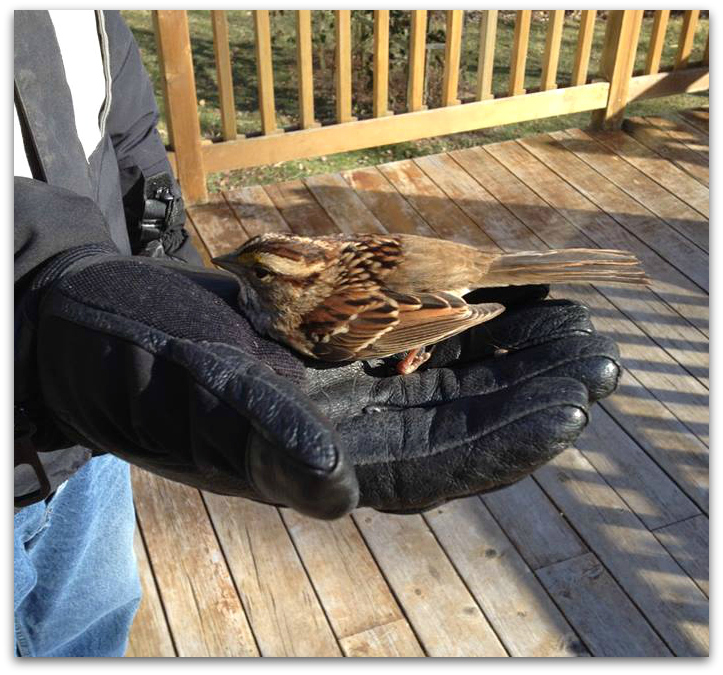 If the bird doesn’t recover in a couple of hours, you should take it to a veterinarian or wildlife rehabilitator. 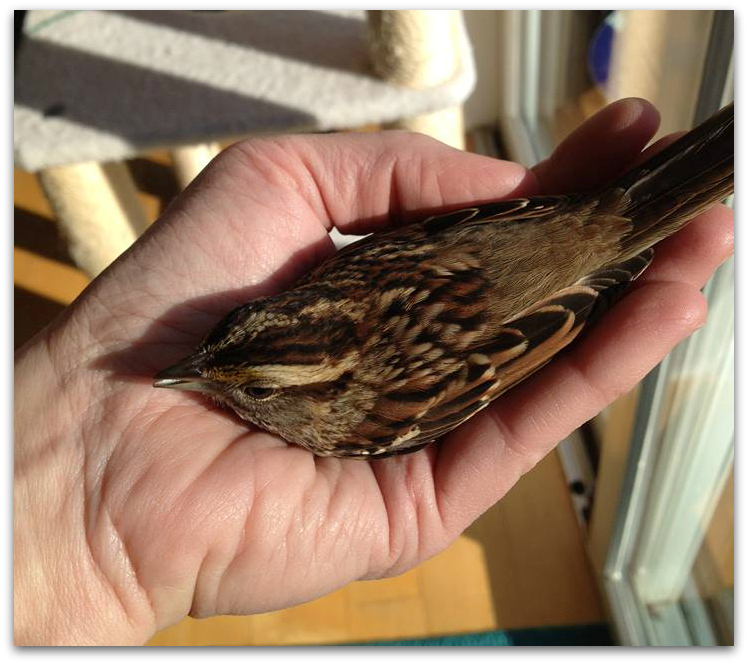 The bird seemed capable of reviving and I didn’t want it to revive in my hand and fly around the house so I put it in a sheltered sunny spot outside where I could keep an eye on it – the window feeder. I had to keep the cat out of the room. 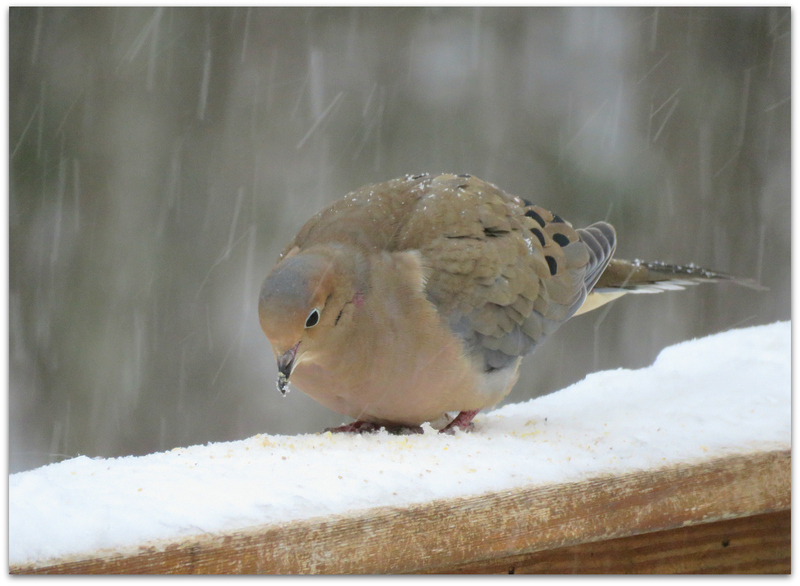 It puffed up its feathers to stay warm. Its eyes were open and it was moving a bit. Finally I went outside and picked it up. It flew out of my hand and into the woods. We looked at the pictures I had taken and identified the species together. We were bonding over birds. Although white-throated sparrows are indeed common, they should by no means be considered ordinary. These sparrows exhibit a characteristic that is rare in birds, they show genetically-based plumage polymorphism. In other words, these sparrows come in two different color forms, or morphs. … an individual almost always pairs with another of the opposite color morph for breeding. And despite the fact that images of the white-striped morph are more frequently presented to illustrate the species, the two color morphs actually occur in relatively equal numbers in the population. Most interesting is that behavior differs between color morphs, especially during the breeding season. Both male and female white-stripe birds are more aggressive than tan-stripe birds. In fact, white-striped females will even sing and contribute to territorial defense, whereas tan-striped females do not. In contrast, tan-striped birds of both sexes provide more care to their young than white-striped birds do. …there is some evidence to suggest that females of both color morphs prefer the less aggressive, more faithful and parental tan-striped males, while males of both morphs prefer white-striped females. As is the case in many bird species, however, female choice dictates pair bonds. The more aggressive white-striped females appear to outcompete tan-striped females for access to the preferred tan-striped males, leaving tan-striped females to pair with white-striped males. Regardless of how opposite morph pairs are formed, this mating style seems to equalize the aggressive and parental qualities of the different pair types. That is, the low aggression and high parental care of tan-striped females offsets the high aggression and low parental care of white-striped males. In pairs formed of tan-striped males and white-striped females, each seems to contribute equally to territory defense and parental care. This morph-specific variation in behavior has drawn a great deal of attention from scientists investigating bird behavior. White-throated sparrows have been the focus of myriad ornithological studies of aggression, parental care, habitat selection, migration, mate choice, extra-pair mating, and polymorphism in birds. In addition, white-throateds have become a model species for studying the physiological mechanisms that control bird behavior. For example, recent studies suggest that behavioral differences between the color morphs are associated with morph-specific differences in hormone levels and brain anatomy. Discoveries such as these provide new and fascinating insights into the factors that influence bird behavior, and spur further research. This common species has an uncommon amount to teach us. 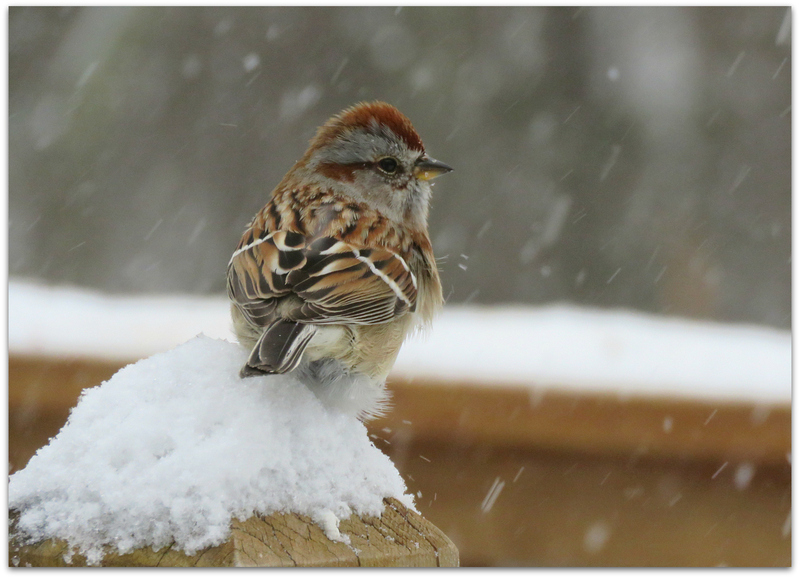 This entry was posted in Uncategorized and tagged backyard birds, birds, birds hitting windows, White-throated Sparrow on January 2, 2015 by Amy.